There was a time you couldn't pay someone to take that mid-century modern door off your hands. So it got taken off the hinges, laid across sawhorses, and turned into Dad's work-bench. And that was if it was lucky. More than likely, it got chopped up into little pieces and sent to the landfill. 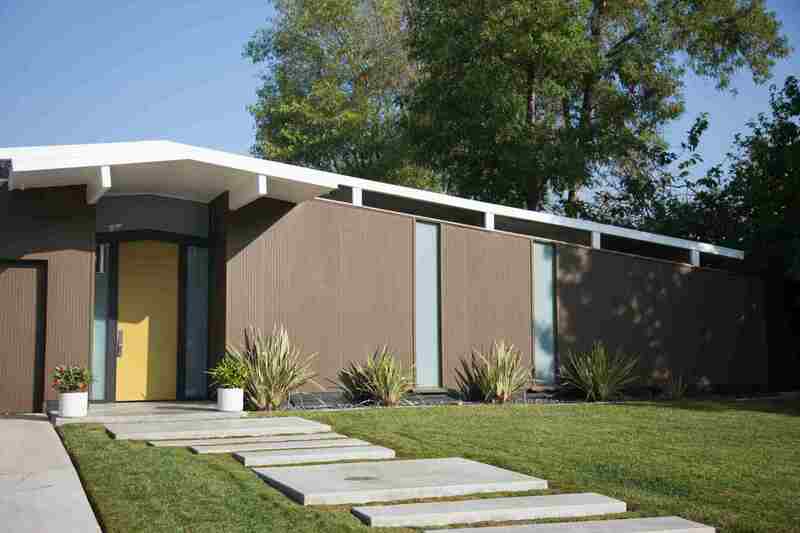 Now you are forty and you have just bought your first mid-century atomic ranch house. The front door is some awful faux Victorian Home Depot special, oozing with fake gold and carved wood highlights, and you are dying to have a flat, clean, geometric door from 1965. Where can you get replicas? The Pulse door is the feeling of a mid-century modern door wrought in fiberglass. Even though fiberglass is certainly not period-perfect, it is a rock-solid, weather-resistant material that lends itself well to exterior applications. The Pulse looks great from a distance, but Therma-Tru missed the memo on some of the smaller details, such as using curvy molding on a door that should be only right angles. Pulse offers alternatives to the long-departed-but-missed Austin TX company Crestview Doors' Nokona, Parkway, and Pasadena. After Crestview went out of business in 2014, a new business popped up, also in Austin, TX, also selling mid-century modern doors. It was rumored that this company, The Millwork Market, was a successor to Crestview, or at least it bought up some of Crestview's designs. But Pam Kueber at Retro Renovation spoke to The Millwork Market and they said that they were not associated with Crestview. In any case, TMM sells those doorlite kits that people love so much. Made of unfinished engineered mahogany, this exterior door from ETO comes in under $1,000 (from $759 to $989). While not strictly copying any mid-century modern styles, this door--with its multiple horizontal rectangles, set in ladder-like fashion--can easily dress up any home from the Fifties or Sixties. Borano is a Florida-based company more associated with high-end hand-carved doors for homes that have a European country style. Yet Borano also has a modern section with a few doors that could grace a home from the 1950s-1960s without being too much of an anachronism. Their Tiama 3, shown here, is 2.25" thick solid mahogany--not engineered wood. If you are planning for the zombies attacking your house during the Apocalypse, you can even go up to an incredible four inches thick. The Tiama 2 is simply the same door as pictured but with two larger panes of glass instead of these three smaller ones. Based in Phoenix, AZ, Neoporte manufactures gorgeous doors in shimmering, glittering metal and glass. Several Neoporte offerings are capable of giving your house an "updated mid-century modern" look, as if Frank Sinatra's Palm Springs house had died and gone to stainless steel heaven. Doors by Decora (D by D) mainly makes super-elaborate beveled, leaded-glass, solid oak-type doors, but lately, they have been developing a Contemporary line. This door, with no name other than 5162, is quite unusual. It has no direct 1960s provenance, yet somehow it feels very much like a 1960s door, with its three squares stacked one upon the other. This Montgomery Alabama-based company custom-manufactures these doors. They also have a nice mahogany four-lite door similar to the Tiama.